Thread veins, known medically as telangiectasia or venulectasias, are small, red, blue or purple thread-like veins that lie just under the surface of the skin. These permantently dilated and visible veins, caused by increased pressure to the veins can develop on any part of the body, including the face, but most often appear on the thighs, calves, ankles or buttocks. They may take on the appearance of a spider’s web. There are two effective treatment options for thread veins. Laser treatment breaks down unwanted face and leg veins using a powerful light source. Sclerotherapy (Microsclerotherapy) is used exclusively to treat leg veins. Here a medical solution causes microscopic damage to cells such that the vein closes. A combination of both treatments may be advised when treating leg thread veins. This will be decided following a medical examination. Laser treatment is often best for smaller thread veins whereas Microsclerotherapy is often used to treat larger thread veins and also for patients with darker skin types. 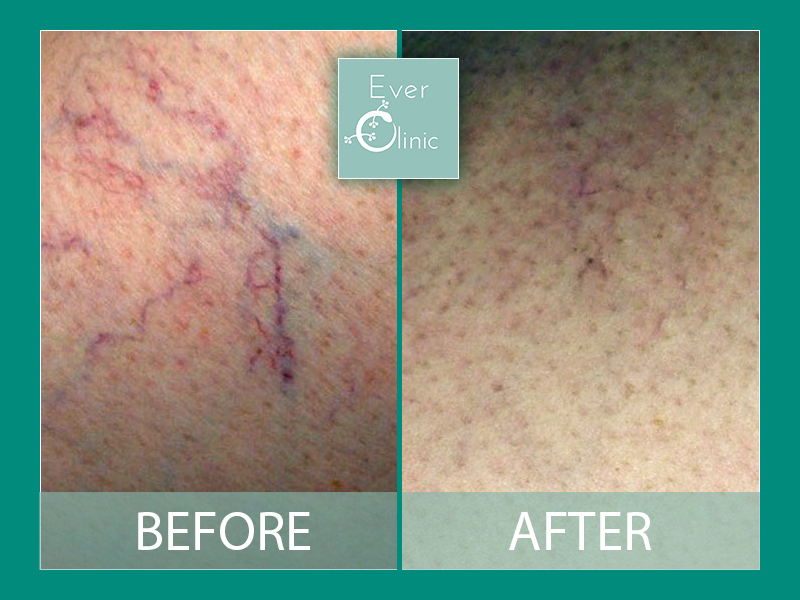 Laser therapy is a highly effective and often permanent treatment for thread veins. Here are some frequently asked questions about the procedure. What type of laser is used to treat spider veins? The most common laser used to treat spider veins is the Nd:YAG laser system. It is a hand-held device and also has a cooling tip to minimize discomfort during the therapy. The Nd: YAG laser pierces the skin and penetrates the superficial blood vessel. The heat generated from the laser coagulates the blood inside the vessel, causing it to collapse and seal. Over the next few weeks, the vessel will disappear and all the blood will be removed by the body’s scavenging cells. The newer laser treatments allow the delivery of a precise dosage of energy to each blood vessel without injuring any nearby structures. During treatment you may feel a slight discomfort as the laser fires. The integrated cooling helps to minimise discomfort while also preventing excess heating of the surface of the skin. What preparations should I take before treatment? There are no major preparations required before the laser treatment, but you will want to avoid sun exposure, aspirin, alcohol and smoking for at least a week prior to the procedure. As for the day of treatment, avoid all creams and lotions on the area to be treated. How do I know if I am a candidate for laser vein treatment? All individuals are evaluated prior to laser therapy. Spider veins do not cause symptoms and are of a cosmetic concern only. For those who have symptoms, further investigation is done to ensure that they do not have varicose veins. Laser therapy is most effective for the very small spider veins and not used to treat large varicose veins. What is the time between treatments? Where multiple treatments are required, they are usually spaced four to six weeks apart. If new veins appear, additional treatments are required for optimum results. What are side effects of laser therapy? The skin above the veins will have a reddish, cat-scratch appearance. This generally disappears over the next two days. What are potential complications of laser therapy? Scarring and pigment change are possible, but uncommon complications following laser therapy. Skin cooling ensure treatments are low risk and relatively pain-free. Results are noticeable following a single treatment. Depending on the size and number of veins, two to six treatments may be needed. Those with a tendency towards vascular problems will most likely require additional treatments. What is the cost of spider vein removal with laser? The average cost for laser therapy may vary from £200 – £400 per session. What to expect after laser therapy? Soon after the procedure, you may feel a slight bump on the skin; it should disappear hours after treatment. The area may also appear slightly redder and occasionally may be bruised. After laser therapy, it is strongly recommended that one keep away from the sun. When can you go back to work after laser therapy? Patients are encouraged to resume all normal activities immediately. How long does it take for the results to become evident? The results of laser treatment for spider veins are not immediate. After the laser therapy, the vessels underneath the skin will gradually change from a dark blue to light red colour, then eventually disappearing in two to six weeks. This medical treatment involves introducing a foreign substance into a vessel with the aim of destroying it. It is a highly effective treatment for ‘telangiectasias’ (thread-veins) and associated reticular veins. It is noteworthy that more than 80% of the population are estimated to have telangiectasias and reticular veins and their presence can signify a more significant venous problem. At your assessment appointment your doctor will carry out an examination which will include a brief ultrasound test as well as the use of a special Veinlite® which helps visualize the vessels under the skin. Following assessment, you will be able to discuss the best options for you. You may of course choose to follow a conservative course of action.